Searching for tiny, elusive gold flakes is like looking for a needle in the proverbial haystack. Just ask Frank Masley of Boise, Idaho. He went looking for that needle and found an entire flag pole instead! Frank has been an avid treasure hunter for fifteen years. Treasure, not gold. Coins, bullets, relics of any kind, not gold. 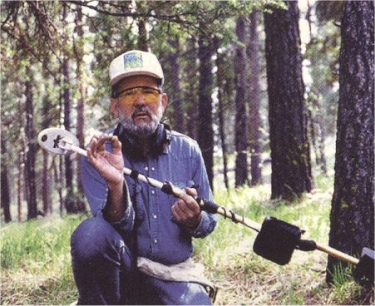 But after years of the “same old thing,” he caved in and bought his first gold detector in May of 1997. Anxious to get right to it with his new Fisher Gold Bug-2, Frank and his good friend Bob Lyons made three trips in five days to break it in. The third time was a charm. On a 120-mile trip to the Blue Mountains just across the Oregon border, success waited for Frank. And find he does; but to do the job right, Frank ground-balances his machine every few feet, especially within the highly-mineralized areas where he searches. One day, while searching for gold with two friends, Frank got a couple of good signals from his metal detector, but thought he might be picking up hot rock. So he switched on his iron discrimination option to see if that would phase out the target, but he kept getting a signal. Then he dug the spot with a hand trowel to check it out further, but the beeping still continued. “One more shovel full, then another, then just one more,” he told himself. When he finally ran a handful of material by his search coil, Frank’s machine sounded-out a tremendously-loud scream. Frank now says it sounded like the whistle on a steam locomotive! So he thought he had found yet another lead bullet, since the area is littered with them. Then he began searching through the dirt in his hand. And there it was! According to Frank, the gold nugget was so big, it could have jumped into his hand and told him all about it! “Oh my god, look at the size of that!” Frank yelled. “Bob, come here and look at this!” His partner meandered over and asked, “What are you hollering about now?” Frank popped it into his hand. “Oh my god! Look at the size of that!” Bob yelled excitedly. “That’s what I just said!” laughed Frank. The two were both jumping up and down like school kids and started to guess at its weight. Frank has been a member of the Boise Basin Search & Recovery Club for ten years. In a short article recounting the event in a recent issue of their newsletter, he was referred to as Frank “Midas” Masley. It went on to report the statistics on his “Heart of Gold” nugget: 1.275 ounces, or 1.16 Troy ounces, or 23.25 Pennyweights, or 36.18 Grams. It’s not always easy to find the time to go metal detecting. But closer to home, Frank has still had the luck of the Irish on his side. One afternoon, he and Bob journeyed to the heart of a long-abandoned Chinese placer mining area in the Boise Basin near Idaho City. They had been there before and had uncovered their share of small nuggets. But after an arduous day of searching, they decided to leave; because the hour was late and the temperature was falling. As they turned to leave, Frank swept his detector over a spot he had already been over, and he got a signal that would “stop a bus.” Inside of one hole which was no bigger than half a cantaloupe, he uncovered a nugget patch and cleaned out a total of 203 small gold nuggets. What a find! After hitting pay-dirt so many times, perhaps beginner’s luck has nothing to do with Frank’s success. Maybe he has truly earned his nickname!